Introducing an all new Purchase Flow! Over the past few months, I’ve spoken to various Hosting providers from around the world and the feedback I’ve received from many of them is that the current Domain Reseller model isn’t something Hosting Resellers are used to. In essence, most of them believed that our current system of signing up for a Reseller program in order to buy one VPS hosting package or a couple of Reseller Hosting packages is a little convoluted especially when it’s so easy to buy a Hosting package elsewhere. This led to a kind of turning point for us when we realized we wanted to create a program for Hosting Resellers with the same kind of services & ease-of-use that our Domain Reseller program is known for! 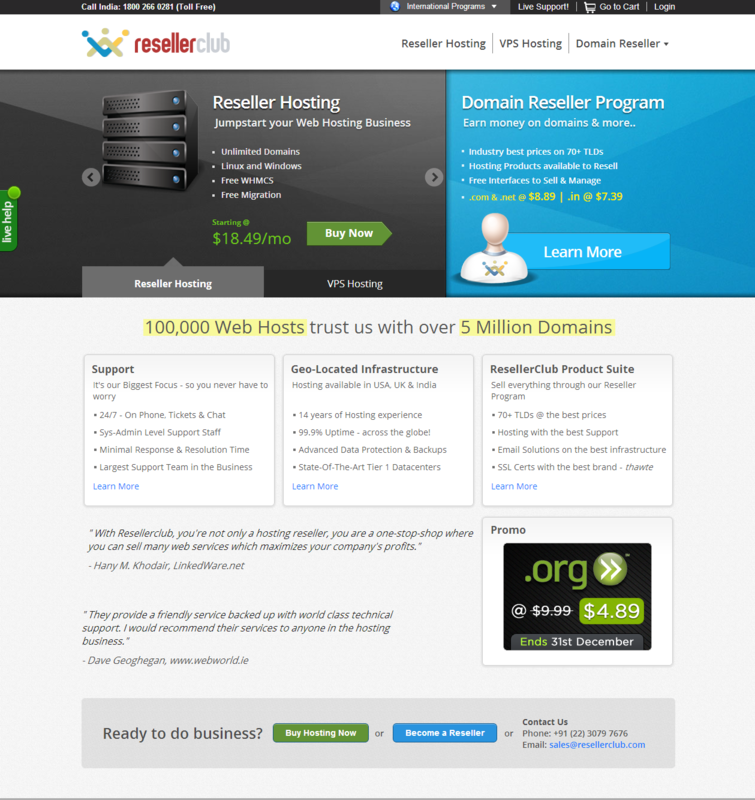 We wanted to be a THE destination for Resellers in the Domains as well as the Hosting space. With this in mind, we went back to the drawing board and thought of everything we could do to make it easier for Hosting Resellers to start their business with us. Among many other initiatives (more on these below), we simply made it easier for Hosting Resellers to buy our VPS & Reseller Hosting packages with our new purchase flow. If you’ve already visited our redesigned website (if you haven’t, do it now! ), you must have seen the new buy flow in action. With this new flow, Hosting Resellers can get started within minutes – there’s no deposit but a straightforward purchase process that is simple and instant. Geo-Located Hosting: As most of you will already know through our emails, we’ll be launching Geo located Hosting on Indian & UK servers this month. This is a first in a series of launches for Geo located hosting. Over the next year, we also plan to set up our Geo-Located Hosting offering in several places around the world. Free & Easy Migration: Recently, we also started an initiative to help Resellers migrate to us without any hassle or effort. Our makes it easy for anyone to get started with us and consolidate their existing packages under a ResellerClub account. If any of you would like more information about this please fill in your details here and one of our Hosting Specialists will get in touch with you asap! What changes for Resellers on our current program? Absolutely nothing! We’re as committed to the Domain Reseller program as we were before. We’re going to continue improving it consistently and making sure Resellers can stay competitive. Pay.Pw: With Pay.Pw in a limited beta with a select number of Resellers, we’re a step closer to launching our own Payment Gateway for Resellers. While this is still in the testing & development phase, I should have a definite launch date for you all early next year. Control Panel & SuperSite enhancements: We’re also going to continuously add new features to SuperSite 2 as well as the Control Panel. Watch this space for updates as and when we launch new features. Apart from these initiatives, our existing Resellers will also be the first to try out all our new products, get access to the best promotions & prices in the industry and will be easily able to offer our Hosting products through their Reseller accounts just like they already do. To sum it up, we’re totally focused on being the best platform for Domains & Hosting Resellers around the world and I thank you all for the great feedback & suggestions you’ve given me & my team. I would of course love to know what you guys think of this new development. Do comment below and let me know.